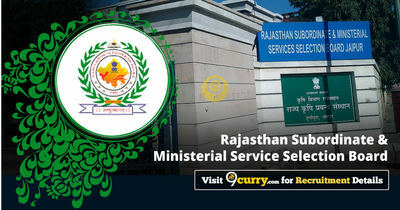 RSMSSB News / Updates 2019: Here are some of the very important updates and news regarding recruitment drives being conducted by RSMSSB - Rajasthan Subordinate and Ministerial Service Selection Board. The recent updated published related to the organization is - Agriculture Supervisor Exam Date 2019. RSMSSB Agriculture Supervisor Exam Date 2019: Rajasthan Subordinate and Ministerial Service Selection Board announced the Exam Dates for Agriculture Supervisor Exam 2019. RSMSSB Junior Instructor & Economic Investigator Exam Date 2019: Rajasthan Subordinate and Ministerial Service Selection Board has announced the Exam Date for Junior Instructor & Economic Investigator Exam 2019. RSMSSB LDC Result Date 2019: Rajasthan Subordinate and Ministerial Service Selection Board has announced that the LDC 2018 Exam Result 2019 will be announced on 15 Mar 2019. RSMSSB Agriculture Supervisor Exam Cancelled 2019: Rajasthan Subordinate and Ministerial Service Selection Board Agriculture Supervisor Exam has been Cancelled. RSMSSB Agriculture Supervisor Exam Date 2019; Rajasthan Subordinate and Ministerial Service Selection Board has announced Exam Dates of Agriculture Supervisor will be held on 10 Feb 2019. RSMSSB NTT Teacher New Exam Date 2019: Rajasthan Subordinate and Ministerial Service Selection Board has announced the exam date for NTT Teacher New Exam 2019. RSMSSB Patwari 2015 Date and Place for DV: Rajasthan Subordinate and Ministerial Service Selection Board announced that the Patwari 2015 DV will be held on 21 Dec 2018 10:30 AM. RSMSSB Tax Assistant Exam Date & Admit Card News 2018: Rajasthan Subordinate and Ministerial Service Selection Board has announced that Tax Assistant Exam will be held on 14 Oct 2018 for which Admit Cards will be made available on 08 Oct 2018. RSMSSB PTI Exam Date & Admit Card 2018: Rajasthan Subordinate and Ministerial Service Selection Board has announced Date for Exam of PTI and Exam which will be held on 30 Sep 2018. RSMSSB Tax Assistant Exam Date 2018: Rajasthan Subordinate and Ministerial Service Selection Board has announced Exam Date for Tax Assistant and Exam which will be held on 14 Oct 2018. RSMSSB LSA Exam Date Postpone Notice 2018: Rajasthan Subordinate and Ministerial Service Selection Board Notice for Exam Date Postpone for Live Stock Assistant LSA Post Exam 2018. RSMSSB IA Typing Test Exam Date 2018: Rajasthan Subordinate and Ministerial Service Selection Board has announced on 12 Sep 2018 that Informatics Assistant Typing Test will be held on 05 Oct 2018 from 9 AM to 5 PM which will be held in four Shifts at allocated centers in Jaipur.